JPPI’s 2017 Global Jewish Dialogue on Jerusalem and the Jewish People offers data that explains why the Jewish world uses the word “betrayal” in reaction to recent Israeli government decisions freezing the Kotel compromise and initiating a new law on conversion. Israel claims to be a state in which all Jews have a stake. It frequently calls Jerusalem “the capital of the Jewish People,” and, hence, ought to consult with world Jewry on matters pertaining to Jerusalem. Jewish communities around the world contribute significantly to developing Jerusalem and are asked to keep contributing to its success. As they are active partners, it would be wise for Israel to consult them in matters related to the city that stands at the center of Jewish identity. Jerusalem’s worldwide significance as a holy city for the three monotheistic religions, means that how its future is shaped may affect the lives of Jews all around the world. Jerusalem’s character has the potential to impact how Israel relates to Jews around the world; It could also impact how Diaspora Jews relate to Israel. Having established that all Jews should have a say in planning Israel’s future, questions about their exact role, and the areas in which they could expect to influence Israeli policies and decisions remain. In previous Dialogues most participants have differentiated between policies concerning political-security questions (such as peace arrangements with the Palestinians) and policies addressing cultural-religious issues (such as how progressive Jews are accommodated at the Kotel). When it comes to Jerusalem, these questions are not always easily separated (is the future of Temple Mount a political or a cultural-religious question?). But Dialogue participants still seem to differentiate between these two areas as we will later show. JPPI Dialogue participants are highly engaged Jews, and Jews in communal leadership positions from around the world. A vast majority of them frequently visit Israel, and have a strong connection to the country. A survey that all 530 participants were asked to answer taught us that even though they live outside of Israel they still perceive Jerusalem as a “home.” They see it as home not only in the sense of feeling at home in the city, but also in the sense of deep emotional attachment, and hence they ought to have a say as its political and cultural future is shaped. Only 16 percent of Dialogue participants believe that Israel ought to determine Jerusalem’s political future without regard to the views of world Jewry. Only 11 percent believe that Israel ought to determine Jerusalem’s political future without considering the perspectives of world Jewry. JPPI proposed three possible arguments for Diaspora influence on the future of the city: 1.) Because it might affect their lives in the Diaspora; 2.) Because Jerusalem is holy to all Jews; 3.) Because Israel wants to keep the support of world Jewry. In essence, these three arguments can be described as follows: one rests on the self-interest of Diaspora Jews, one on the self-interest of Israel, and one on the partnership between Jewish communities. When it comes to Jerusalem’s political future as well as its cultural future, the choice of the plurality of participants was the partnership argument. Jerusalem is not the first topic JPPI has utilized in trying to assess the extent to which non-Israeli Jews want to be consulted or involved in decisions made by Israel. Two years ago, participants in the Dialogue: Jewish Values and the Use of Force by Israel in Armed Conflict were asked a similar question, as was the case last year as part of the Dialogue: The Jewish Spectrum in Time of Fluid Identity. Of course, the questions were phrased differently to suit the topics discussed in each of these Dialogues. But the concept was similar. In 2016, JPPI asked participants to agree of disagree with the statement: Thinking about Israel-Diaspora relations, Israel should consider views of non-Israeli Jews when determining who is considered Jewish in Israel. In 2015, JPPI asked them to agree or disagree with the statement: Thinking about Israel-Diaspora relations, Israel should consider views of non-Israeli Jews when conducting armed conflict. This year we asked two questions, one regarding political decisions, and the other cultural decisions: Thinking about Israel-Diaspora relations, do you generally believe that… Israel should decide how the political\cultural future of Jerusalem ought to look: 1.) without regard to the views of Jews living outside of Israel; 2.) consider the views of non-Israeli Jews mostly because its decisions may affect their lives in the Diaspora; 3.) consider the views of non-Israeli Jews, mostly because Jerusalem is the Holy City of all Jews; consider the views of non-Israeli Jews, mostly because it wants to keep the support of other Jews. Here is a table comparing the answers to all four (one each in 2015 and 2016, two in 2017) questions: First, it clearly shows that Diaspora Jews want to be considered in decisions made by Israel. Second, it also shows that the more the question concerns “Jewish” themes the more inclined s/he was to want Israel to consider Diaspora views. Thus, the expectation that Diaspora viewpoints be considered was higher when determining who is considered Jewish in Israel than it was with respect to Israeli decisions to go to war. The expectation that Diaspora perspectives be considered in shaping the cultural future of Jerusalem was higher than in shaping its political future. Then again, JPPI’s survey results this year hint that even the political future of Jerusalem has a “Jewish” meaning beyond Israeli considerations, and hence, according to Dialogue participants, the political future of Jerusalem is not up to Israel alone to decide. When conducting armed conflict When determining who is considered Jewish in Israel when deciding the political future of Jerusalem When deciding the cultural future of Jerusalem Ave.
Three years of asking a very similar question also provides us with an opportunity to conclude with confidence, that world Jewry expects Israel to consider its views less out of pragmatic concerns and more because of the sense of partnership. Two of the options on the menu in all three years were pragmatic concerns: Israel’s decisions can impact Diaspora Jews, and Israel’s decisions could affect Jewish support for Israel. One option tends to focus on the notion of partnership. All Jews have the city, all Jews define Jewish values, all Jews define Jewishness – and hence all Jews should be taken into account as Israel makes its decisions. 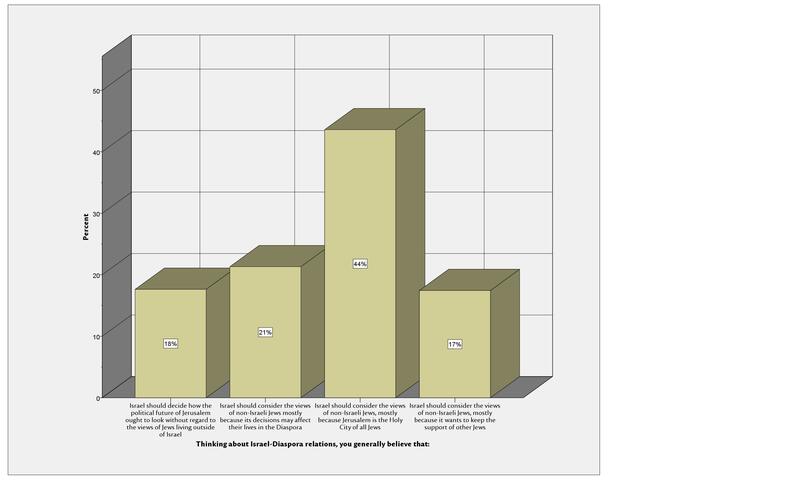 As the table above shows, when it comes to armed conflict – an issue less instinctively associated with Jewishness – Dialogue participants opted to mention practical reasons to consult with them (and about a third of them did not think Israel should consider their views at all). But the more the issue feels “Jewish,” the clearer the tilt toward an assumed partnership. Fifty-one percent for deciding the cultural future of Jerusalem, 54 percent for determining who is considered Jewish in Israel. “Betrayal” is the expression one expects when a sense of partnership is suddenly breached. This sense has clearly presented itself in the last three JPPI Global Jewish Dialogues. See: Netanyahu: Jerusalem Is the Capital of the Jewish People Alone, Haaretz, May 17, 2015. Some Jews do not wait for Israel’s permission when it comes to trying to influence the future of Jerusalem. This was visible at certain points in negotiations between Israel and the Palestinians. See: Whose Jerusalem Is It, Anyway?, Shmuel Rosner, Slate, February 28, 2008. Betrayed By Bibi: One Wall, Two Peoples, Gary Rosenblatt, The New York Jewish Week, June 27, 2017.